24 months warranty, 90 days money back guarantee and friendly customer service. 1. Ensure all parts are in package when you open the pack box, if not, please contact our customer service team to ask for a replacement. 2. 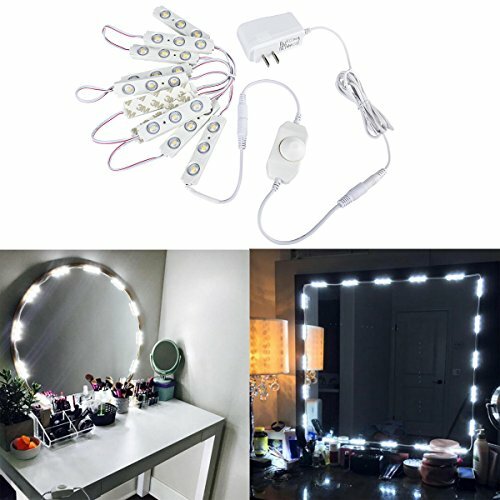 Tear off the cover of self-adhesive tape on back of module light, stick the modules surround your mirror by a perfect shape. 3. Plug the lights to dimmer and plug dimmer to LED power supply. 4. Plug the power supply to power outlets, the lights will be work, use dimmer to adjustable the lights' brightness. 1. Self-adhesive tape on back of module light and wired gaps between module lights make it easy to install. 2. Dimmable, you can adjust the light brightness as you like. 3. 12V safe work voltage.